Through small means we were able to meet great needs﻿—both physical and spiritual. In December 2004, I was serving as a full-time missionary in Lins, São Paulo, Brazil. The local ward and branch decided to participate in Brazil’s annual “Natal sem Fome” (Christmas without Hunger) program. Teaming up with several other entities﻿—including soldiers from the Brazilian army, mail carriers, and members of other faiths﻿—we passed through several neighborhoods collecting food that would later be given to the needy of the city. We also used this as a great opportunity to give out pass-along cards, or “friendship cards” as we called them. About 2,000 cards were given out. Many of the members commented on the great feelings they had felt as they served and shared the spirit of Christmas under the hot Brazilian sun. It was an impressive sight to see the soldiers handing out pass-along cards from a church they didn’t even belong to. One week later we received 127 requests for the Joy to the World Christmas DVD featuring the Mormon Tabernacle Choir. The next week we received 22 more. My companion and I started teaching these people and were able to enter into many homes as a result of this project. I will never forget the joy and love of that special project, when we helped spread the gospel and bring relief to many families’ hunger. Both spiritual and physical hunger were lessened. I know that through small and simple things (such as a pass-along card) many great and wonderful things (such as the salvation of the souls of men) come to pass. This experience was evidence that many opportunities surround us during Christmas and other seasons to bring forth this marvelous work and a wonder. 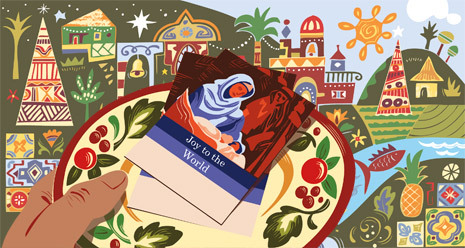 The Joy to the World DVD and pass-along cards for the DVD are available at store.lds.org.